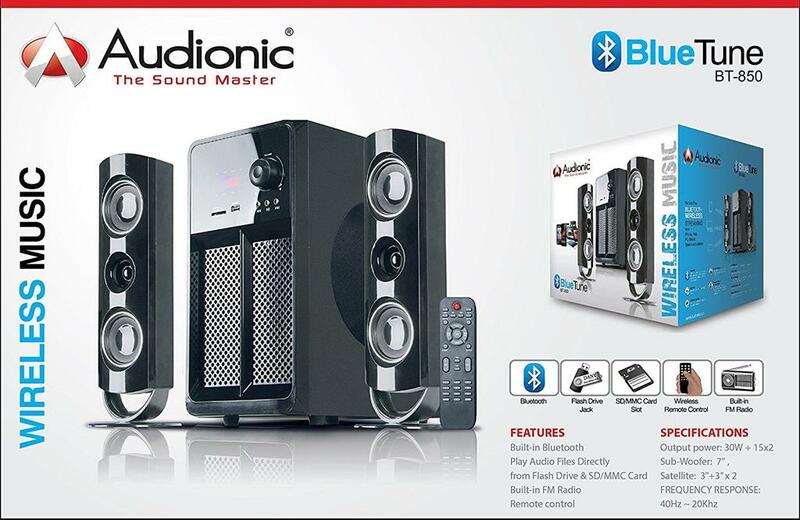 The Audionic BlueTune BT-850 series 2.1 Channel hi-fi Speakers is perfect for big rooms that need big sound, unleash the driving bass, lush midrange, and soaring highs of a multi-speaker audio system. Connect it with any Bluetooth device like mobile phone, laptop, or Tablet PC and enjoy the Perfect sound. There are so many other inputs are also available like auxiliary, USB / SD/ MMC and FM Radio. • Built-in Bluetooth and Bass Duct Technology. • Output Power: 30W + 15W x 2. • Sub-Woofer: 7.0inch , Satellite: 3 inch+3 x 2. • USB Playing Port and SD/MMC Slot.